Discussion in 'Gran Turismo Sport' started by GTPNewsWire, Mar 29, 2019. 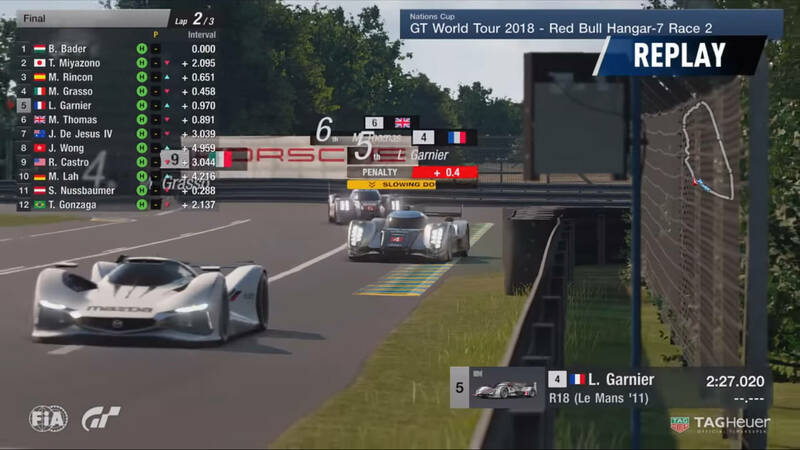 This article was published by Andrew Evans (@Famine) on March 29th, 2019 in the Gran Turismo Sport category. dlshearon, FKAustria1911, JaZZyGee and 21 others like this. I already said this in the daily race thread but I'm really pleased this has finally come. No it won't fix all the problems with the penalty system but it will help as there is more of an incentive to not get a penalty that you can just scrub off at the end of the race with little to no consequence. On some tracks just a small penalty could now put you back several positions, particularly in the early part of a race. at1503, YoBuck, Moby45 and 35 others like this. YoBuck, fastone371, K3Tuning and 7 others like this. fastone371, Qyn, JD_18 and 3 others like this. Maybe fix the penalty system 1st, before making the punishment harsher? Mike-ZENKAI, TamasToth, fastone371 and 4 others like this. TamasToth, Qyn, devildog666 and 5 others like this. Finally, it won’t fix all the problems with penalties but at least some of the bad drivers will get properly punished and put at the back for doing dumb overtakes on lap 1 when everyone is bunched up. YoBuck, fastone371, K3Tuning and 12 others like this. Good. Personally I hate trying to figure out the best way to deal with penalties when I get them. And as someone else mentioned, it will force me to be even more careful not to get penalized. This will only make me a better driver. YoBuck, Azerach, Maverick52 and 11 others like this. Great news! I hope there will be an option to use this in lobbies as well. YoBuck, fastone371, K3Tuning and 1 other person like this. Have they fixed the cheat with the FIA-style Penalty Zones whereby you could brush the brake with smallest-possible-input and barely slow down? "Fixed an issue in “Sport” mode wherein forced Time Penalties wouldn’t function correctly in the automated penalty zone;"
fastone371, Qyn and Sander 001 like this. The only thing I hate about this is the hovering yellow markers. They put all the time & effort into making the cars & tracks as realistic looking as possible, then ruin it with these unrealistic arcade style 3d graphics. I found them seriously off-putting in the live broadcast, & hope that they aren't present in replays with the HUD off in-game. Would be nice if drivers had an option to turn them on & off while driving too. EDIT: Tell a lie! It's not the only thing I hate about it; I've never seen a real-world motor race where drivers cars are forcibly slowed down by some computer controlled system. It's yet another move away from realistic racing, & I for one can't stand it. Yes this has been fixed. The game now applies the brakes properly, regardless of what your inputs are going into the penalty zone. fastone371, K3Tuning, Qyn and 4 others like this. I also noticed recently that the game actually gives you a SR down penalty if you rear end someone. K3Tuning and fastone371 like this. Fantastic, tired of having races ruined by uncourteous drivers. Had one get to the bottom of Forrest's Elbow, delay acceleration whilst in the middle of the track to scrub a penalty, unghost when I got to their bumper and...well you can imagine how that ended up considering the speed I had already built up..same tactics caused another pile up at turn 13/14 chicane at Nurburgring GP. Just poor etiquette if you ask me. Glad this is coming to put a stop to the nonsense. SmokeyMR2 and fastone371 like this. fastone371, Qyn, Pigems and 1 other person like this. It really isn't much different from a virtual safety car applied to the Formula E series. Only difference is drivers get the countdown to slow down and penalty applied if they don't. Only difference is it is given to a single person used in a single spot. If anything real racing will change going forward on these types of issues. fastone371, Qyn, acedition333 and 2 others like this. Augmented Reality helmets are the future, so seeing things through the helmet that may not be there in real world, isn't that far fetched. As for the "real world" comparison. Drivers can die, or lose the seat in the team, or a host of other disincentives for colliding with others. That being said, the stewards don't pass out penalties on the fly unless the infraction is egregious. They fly a black flag that forces a penalty to be taken or the racer in unclassified, and that works because that black flagged racer is not prone to smashing into other cars on track because he feels the penalty is unwarranted. How will you FORCE a player to serve a penalty without intervention? Rely on their good graces and honor to do the right thing? SmokeyMR2, fastone371, Novalee and 2 others like this. O604 and Sven Jurgens like this. The closest to slowing drivers down by computer controlled system are, the virtual yellow flag zones. This is where the drivers must maintain a set speed until cleared to proceed back up to race speeds. I guess PD had to do it this way, as to not confuse players, if there was indeed a yellow flag situation. Having them float on the side, as opposed to placing virtual lights or even painting on the sides of courses, in those zones. Just a few thoughts. fastone371 and Pigems like this. Just hope Real World track limits become pretty much forgivable. Autopolis and Interlagos still have stupid part of track limit, how can we get penalty if we just taken outside part of track and not even have advantage but still get some penalty. Other that I hope they make penalty spot into 2 even 3 area rather than 1. Like on Maggiore we can used at backstraight before downhill, start area, and after turn 4. It will give you better time to catch up in front if you get some penalty. Voodoovaj, fastone371 and Pigems like this. Finally. I was wondering whatever happened to this coming to sport mode. I remember reading about it awhile ago and thought it was gonna be available asap but I guess it was just for those esports events that GT be having. But then it’s not racing, it’s just 12-20 guys hot lapping on the same track, driving through each other when it’s convenient. Joti Plahay, Slo_Wass_Mike, tonderai and 9 others like this. That's what it is now. Qyn, Pigems, SpaceMaN47y0 and 1 other person like this. A part of me hopes there are no penalty zones directly in front of the start/finish line on the last lap so that anyone who dumps you in the final moments gets the time forcibly added on to their finish. The races with slower cars especially hurt. The Mini Race saw me shoved out of the way on the last lap. His penalty was served with little consequence because I had to spend an hour re-accelerating. Qyn and fastone371 like this. I was thinking first past the post would get a score that could be potentially usurped by someone who had got more clean passes in a race. That way your creating a culture of racecraft rather than just first at all costs, which seems to create rash driving. Being slowed down is unpalatable as a penalty and the AI doesnt seem able to apportion blame fairly at the moment its a very subjective thing. Potentially being slowed down for an incident thats not your fault is galling. Just shadowing should be a bit longer, I smashed some drivers in yellow zone... They don't really care about going away from driving line. Mostly. I hope they make it more strict. It's not that you gain time by going wide, it's that you create a hazard when returning to the track. The problem is, the game can't distinguish between having to go wide to avoid an accident or from over driving your car. It would be kinda harsh to end up with a penalty for preventing a secondary collision. That often already happens, yet with penalty zones it would be even more an incentive to gamble with the penalty system instead of avoiding and getting a penalty anyway. Qyn, fastone371, Quakebass and 1 other person like this.